Creative title, right? Can you tell I’m tired and worn out? It’s been a challenging few weeks since our son’s diagnosis. He’s doing fine, by the way. We are all adjusting to the new normal, though I feel like I’m struggling to get back into some kind of routine. I’m hopeful things will smooth out even more next week. I’m currently visiting family and making good use of the new iPad Pro to finish this site update that I started earlier today before the chaos that is packing and prepping for a weekend away. I’m really loving this new device, particularly how it syncs so nicely with my iPhone without any hassle. Technology that just works scores major points with me. When I opened Safari on the iPad, I realized I couldn’t remember my parents’ WiFi password and they had already gone off to bed. I turned my phone on to see if I had saved it on there somewhere, since I’ve had my phone on their network before. I immediately get hit with a prompt asking me if I wanted to share the WiFi login with my iPad. Little things like that are just so nice. Anyway, I’ll try to stay focused here as I fight off The Tired (getting up early tomorrow for our annual visit to King Richard’s Faire). What the heck am I posting about today, again? Oh yeah. Last year I unintentionally started a new tradition for myself. My Samsung tablet was just a few months old and I was looking for a project to play around with on it. Since my wife was the one to do all the research and procure the device, I wanted to make something for her birthday with it. I quickly settled on something dragon related, since she’s quite the dragon lover, and I decided whatever image I came up with I was going to secretly put on her desktop while she was on some annual travel for work. 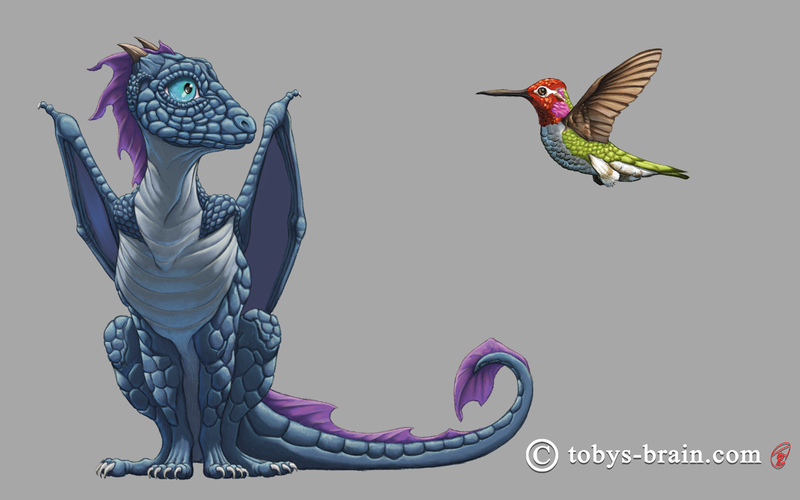 The result was the Teal Crested Leopard Dragon, created using the Sketchbook Pro app. This year, my wife was traveling around her birthday in September again, so I thought it would be fun to do the same thing, and now a tradition has been born. This was before she surprised me with the new iPad, so I used Sketchbook Pro once again on the Samsung Tablet, which had actually developed a few screen cracks. Given the nature of the app and the layer limitations based on canvas size and resolution, I had to employ a clunky work flow, just like last time. First I worked up a detailed sketch, keeping the figures separate from the background and foreground elements. Because I wanted to “paint” the different elements separately to have more control, I had to open each one as it’s own file to render. 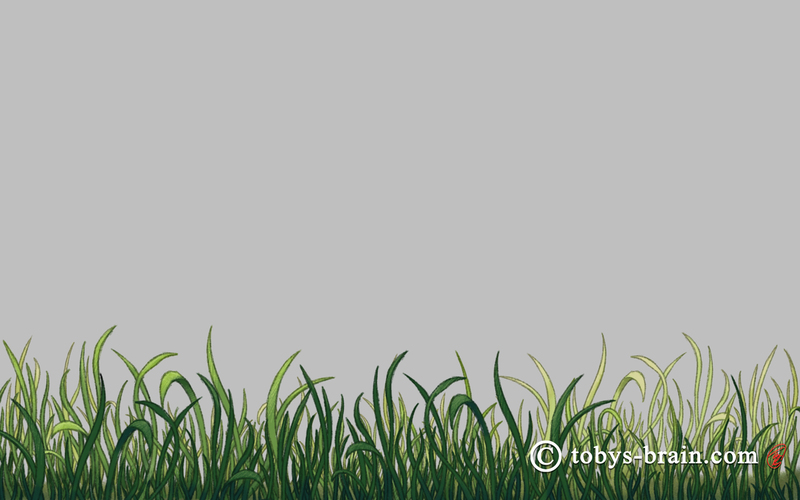 This patch of foreground grass was actually about 3 different layers: a fore, mid, and background. 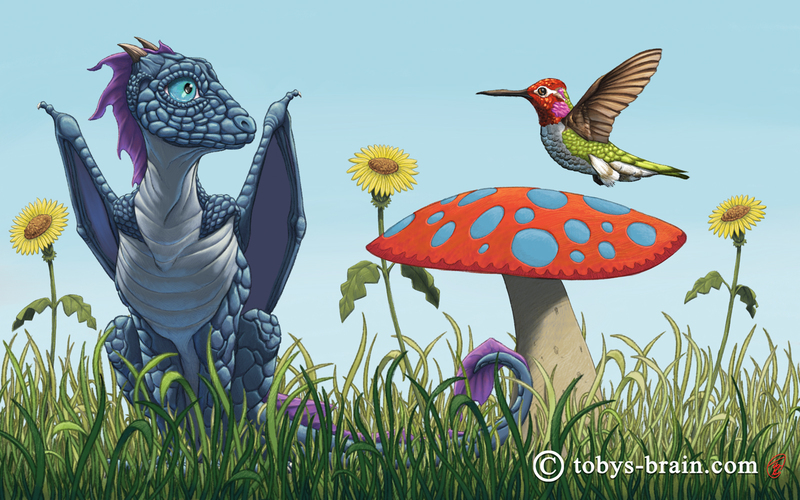 I wanted to keep the closer blades of grass bigger and darker and have more light on the grass closer to the dragon. Next I focused on the back ground elements. Then I moved on to the figures. 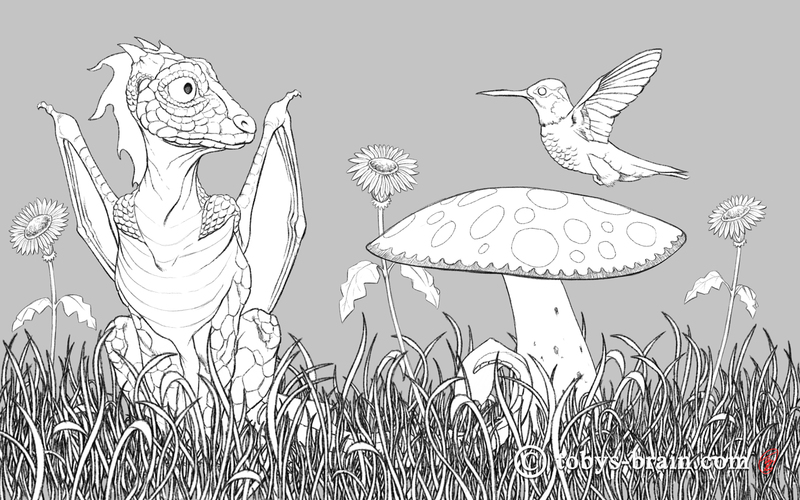 This whole process was tedious, but the dragon and the hummingbird, being the focus of the image, were particularly so. I’m not saying it wasn’t fun, it was just extremely time consuming. With the three separate sections complete, it was time to combine them into one image for some tweaks. 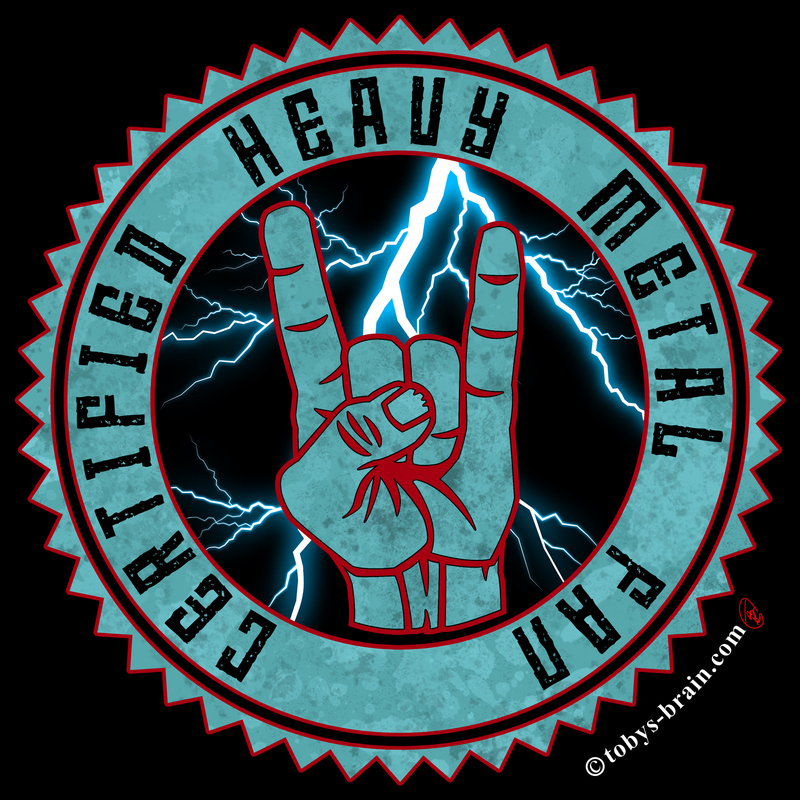 At this point I decided I wanted to bring it in to Photoshop to muck with a few things (since I had to bring it in there to add the logo and some metadata before I could post it online). The humming bird looked weird to me, because whenever you see one, it’s wings are always a blur. I also wanted to blur the background a bit, trying to give the image more depth of field and keep the eye of the viewer more trained to the subjects. I could have pushed the wing blur a lot more, but I didn’t want to completely lose all the detail I had painstakingly added, so I kept it more subtle. So there you have it, year two of my new annual tradition for my wife’s birthday. This particular image was drawn almost compeltely with Sketchbook’s pencil tool. I really liked the subtle texture it added. I’m pretty happy with this piece, though I still see it’s flaws. I started out with just a simple vision of a little, almost cartoonish dragon sitting on the left of the canvas, looking to the right. I knew it was boring, so my brain told me to add the humming bird to lend a sense of scale. I then thought it just didn’t look right, they needed a setting. 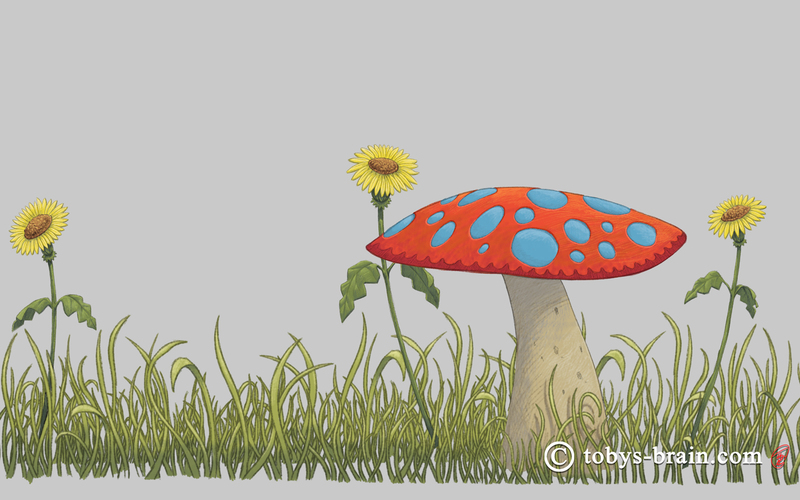 First the grass grew, then the mushroom showed up, the dandelions were almost a last minute after thought. I easily spent a few dozen hours from start to finish on this one, but my wife is worth that and more. She’s the reason I’m not just working digitally, but why I’m able to pursue my crazy art dreams at all. She probably deserves some kind of special award for that. Happy belated-public birthday, my love! (Just for the record, I did finish this about a week after her actual birthday, but she had been traveling so much for work that it didn’t really matter). In other Toby news, I’ve been slowly working on a new commission for L.S. Gagnon, it’s a new cover for her new Warlock Series of books, which are a follow up to the popular Witch Series novels. I say slowly because I was just about to start working on it when my son wound up in the hospital and my studio time has been interrupted and distracted since then. Things are normalizing, though. I’ve spent many hours creating some new tiling patterns in Photoshop that I am using on this cover and will come in handy for the future covers. One of the many things I want to do at some point is to spend some time creating a bunch of different tiling patterns. They are great fun, and though tedious, can save time in the long run. Anytacos, it’s quite late, I have an early morning, and I’m just rambling at this point anyway. Good night, interwebz.